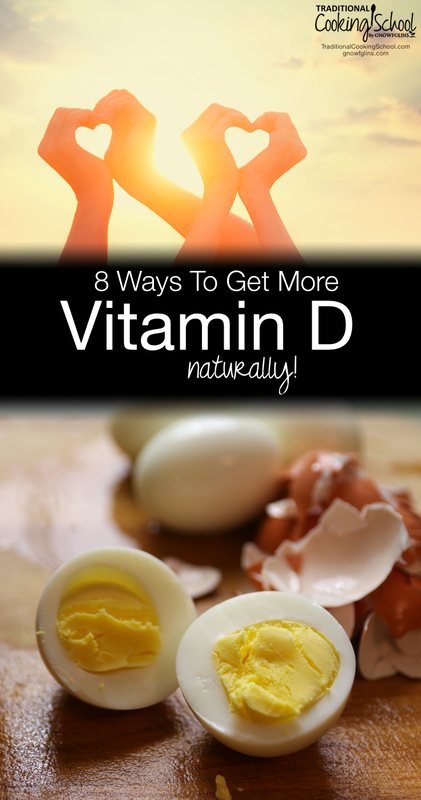 Top 8 Ways To Increase Vitamin D Intake Naturally! Did you know that many of us come out of winter with a slight Vitamin D deficiency? It's true! And it's only April — so the weather might not be all sunshine and blue skies yet. Despite its name, Vitamin D is a hormone, not a vitamin. Our bodies need it to function at their best. It increases bone health and even helps out the nervous system. As of 2010, the recommended daily allowance of Vitamin D is 600 IU for healthy adults, children, and pregnant or nursing women (source). Vitamin D deficiencies have been linked to high blood pressure and even cancer. When I recently found myself deficient, I decided to increase my daily uptake naturally through food and sun — instead of synthetic vitamins. If you'd like to join me, here are 8 ways to get more Vitamin D naturally! These are a collection of easy ways to up your Vitamin D intake. Pick a few that look doable to you — and incorporate them into your daily routine! This is a no-brainer, but not always easy for those of us living dark, cold, cloudy places. 😉 Aim for 15 to 30 minutes of natural sunlight per day. Button mushrooms especially are naturally high in Vitamin D. Add them to your favorite dishes — like meatloaf, pizza, or quiche. Salmon, mackerel, tuna, herring, and sardines are all high in Vitamin D. Just 4 ounces supplies your entire day's dose! Ever heard of tallow before? It's the fat rendered from cows, sheep, or goats. So next time you buy a quarter, half, or whole cow, ask for suet and render your own tallow (learn how here!). And keep in mind that grass-fed cows contain higher levels of Vitamin D than their conventional counterparts. Use the tallow to fry up your morning's eggs and enjoy a nice boost! Liver from grass-fed cows has high levels of natural Vitamin D.
Do you have trouble eating liver? You can dehydrate and encapsulate it yourself, or check out our 7 Reasons Why You Should Start Eating Liver Today + How To Eat It Without Gagging for more ideas. Eggs from pastured, free-range hens who ate bugs contain a small amount of Vitamin. If you scramble 2 eggs in tallow and throw in a handful of diced button mushrooms, you'll be close to reaching your daily dose of Vitamin D! Do I really need to coax you to eat butter? 😉 Put it on everything! And remember, butter from grass-fed cows has significantly higher levels of vitamin D than butter from their conventional counterparts. Learn how to make your own cultured butter here! Last but not least, you can supplement with cod liver oil to boost your Vitamin D level. We recommend taking cod liver oil with butter oil alongside, or blended with, so you can maximize the benefits of each. What are your favorite natural ways to get more Vitamin D? I love mushrooms! So glad to see they are really good for you. Thanks for sharing. Good one! 😉 We reworded that. I’d love to hear how it helps him. haha…that made me giggle too. Thanks for pointing that out. I have chronically (very) low vitamin D and live in Michigan, so I can’t always get it naturally. Try as I might, I can’t seem to get my levels up to a normal level. I recently added fermented cod liver oil into my daily regimen. I am interested to see where my levels are with my next blood test! Erin, I’d love to know how your results were. Sunshine is definitely the best way, but if your shadow isn’t shorter than you are, then the angle of the sun doesnt allow the UV-B rays which create Vit D to penetrate the atmosphere. Even here at the border between TN and MS that means no Vit D from the sun between Oct and Mar. Supplementation is crucial in order to get enough Vit D to fight disease. I was just diagnosed with Vit. D deficiency. The doctor gave me a prescription for 5,000 BU’s once a week. What’s your opinion on that? I’d rather do it naturally. Thinking I was given same med years ago, read up on it and didn’t take it. I also didn’t add what I should have to my diet. Probably why it’s still low.